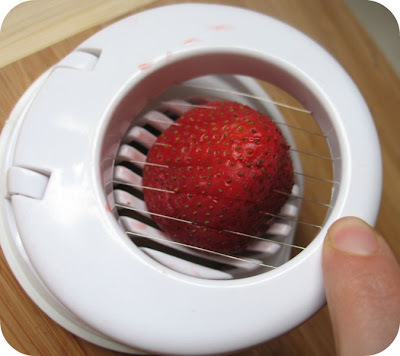 Here's a quick and easy way to cut up lots of strawberries in a hurry. 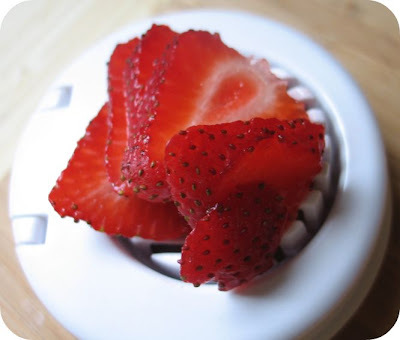 First make sure your strawberries are washed and hulled. Then get your handy-dandy egg slicer. Push down slowly but firmly. As you push down the strawberry will guide you..
And voila! A perfectly, evenly sliced strawberry! I was able to cut all these strawberries in about 15 minutes! That's an awful lot of strawberries....whadaya making, baking? I know it has to be something strawberry-licious. Come on...fess, er, post up! Yum! I use my egg slicer to slice mushrooms as well- makes it so much easier. what does one use that many strawberries for??! Bonnie - good to know! thanks! You guys are so funny! :) Remember Linda's Strawberry Nostalgia cake, well that day I didn't just make cake for her but I also made strawberry shortcake for 50+ people too. To make it easy to serve, I put it into cups so everyone could just grab one and go. Unfortunately I didn't get a very good picture of one close up.. but if you want to see what all the cups looked like, you can see check it out here> I was saving this post for when I had a baking lull. 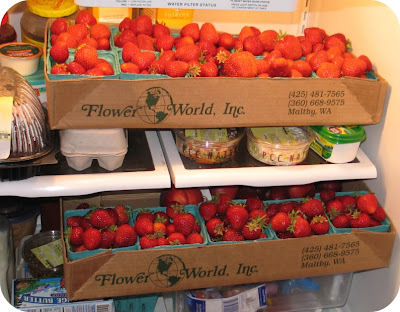 Wow, That is alot of strawberrys! All kidding aside how long did it take you to assemble? 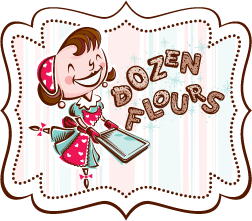 What did you use as the shortcake? I finally downloaded the Windows Writer. THANK YOU! THANK YOU! It'a a huge help! What a great tip! 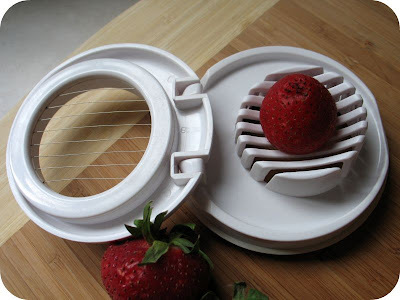 This would be perfect for making strawberry fans as well, by leaving a smidgen of the top together and fanning out the slices. Thanks! Wow, what a clever way to slice them up! I bet my kids would love to try that.